My late grandma used to bake bread every day, just one of the things she was famous for. There was always a saucer of softened butter in the cupboard, along with a jar of honey. The air in her home smelled like yeast and warmth. I wish I would have understood the significance of this before she was gone. I wish she'd have taught me all her secrets. I didn't get her blue eyes and the top of her head barely reached my bony shoulder, but her love for a delicious meal and the value she placed on time spent in the kitchen fell on me. As much as I've always found my brown eyes boring, I wouldn't make that trade. Sunday morning we woke up to snow falling in thick blankets. It didn't stop all day, and by the time it was over, we had nineteen inches. After being cooped up all day with eight people in the house, (Eight. 8. EIGHT. How do you big families function in the winter? I struggle.) we got the notice late that night that school was canceled for Monday. I quietly despaired, but only for a minute. And then I started planning. I have always wrestled with guilt over the fact that I'm not great at "playing" with my kids. It's always been this way. I used to read to them for hours. We like to do crafts. We can veg with the best of them. I dispense ideas, "Go build a fort! Use every soft object in the house!" along with wisdom, "Only boring people get bored". But I've never enjoyed playing Barbies or Thomas the Train. Legos never did what I wanted them to do. Polly Pockets? Shoot me now. I'm about to release my darkest secret into the atmosphere: I used to dread the soul-numbing "game" of pretending to eat pretend food. My kids grew weary of me only ordering Mexican food and when they handed me a bowl with a plastic blob of "peas", I'm not gonna lie, I was disappointed. I know most of you don't find this soul-numbing, hence the guilt I've walked around with for a solid ten years. But I realized something on our snow day. I'M A DIFFERENT KIND OF AWESOME MOM. And if it's true for me, it's true for you. Your kids and my kids will have unique experiences (and different varieties of baggage, let's not kid ourselves,) but they will walk away knowing they were safe and loved. That's what matters most. I asked Calvin recently how he would think of me when he's older. Guess what he said? "I'll imagine you standing by the stove, cooking something delicious." It feels like a win, and it also feels like the truth. Life has been really full around here, in ways that aren't all fun or easy. I was blessed beyond measure to have meals brought to us a couple weeks ago by my mother-in-law and sisters-in-law. It came at the best possible time and made us feel seen and supported. Also, I was in a place where I couldn't wrap my mind around getting food on the table. IT WAS AWESOME. But this week, food has been my sanity. On Monday, our cooped-up snow day, I woke to four little people whom I love so much, and I was ready to just be present. I wanted them to have a fun day at home, but I knew I was a big part of that puzzle. I needed to have fun in order for them to feel the space to have fun. We started off with an oatmeal bar. My kids eat breakfast at school every day, and I'm not going to lie and say I hate it. I don't hate it. I love it. We're up and out the door in 20 minutes, yo. But I do miss having breakfast with them. I cooked up a batch of rolled oats and we all topped our own. No two bowls alike. 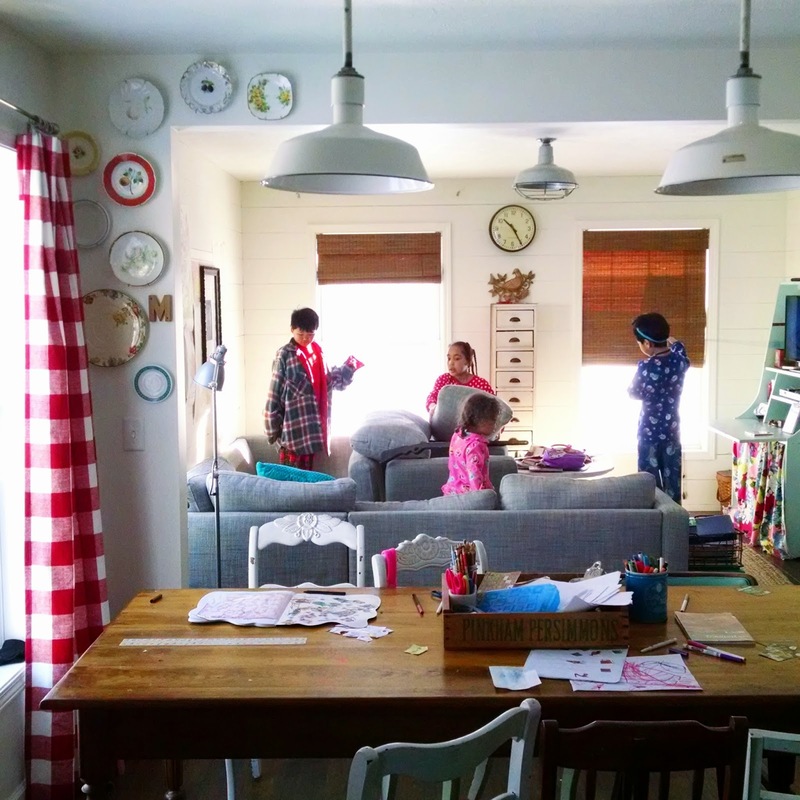 After they played in the snow, we had homemade hot chocolate and cinnamon toast and while we crunched, we remembered one of our old favorite poems, "Animal crackers and cocoa to drink, that is the finest of suppers, I think. When I am grown up and shall have what I please, I think I shall always insist upon these..."
Dinner was Orechiette with bacon meatballs and bread-sticks, then Lemon Souffle with whipped cream for dessert. Basically, I spent the entire day in the kitchen. I had helpers and we even took a craft break. But I realized that this is something I can offer the ones I love. I also realized cooking is inexpensive therapy. It's something I can control, a problem easily solved. It engages my senses and my brain. It nourishes my family. A friend of mine wrote the following status update on Facebook last year and I saved it immediately, "I think ta nites dinner is gon be pinto beans nd pork neck bones wit some cabbage nd bacon ta boost tha flava." It's just so awesome. I've never craved pork neck bones. But it never gets old, the way we're all so different yet so obviously separated at birth. We want the same things. We retreat in different ways and numb ourselves in different ways, but we all retreat. We all numb. We celebrate. We regroup. We give ourselves grace for a new day. When things are chaotic long enough, you'll find me in the kitchen, probably with messy hair and yoga pants. For me, cooking brings a little solace. My grandma had seven children. Her first three were all boys, born in a three-year span. After all this time, I think I may have cracked the code on all her nut-brown loaves of bread. Most of what I cook is on my Pinterest page if you want to follow. It seems you did crack the code. I can so relate! I love kids and babies, even tho I don't have kids of my own yet, but playing those games is a special kind of torture. This week I've been baking up a storm. I couldn't figure out where this overwhelming urge was coming from but you put it into words for me. Solace! Your post resonates with me as we have been buried in snow here in Boston for two weeks. School cancellations galore for my five-year-old; my hubby working from home frequently as he couldn't get to work on the train or by car. I spent some time beating myself up about not enjoying legos, and other games that my son was engrossed with. Netflix was used as was the IPad, and I asked myself whether or not I was a good mom. In the midst of this; however, I did manage to bake four loaves of bread (my grandma and mom's recipe), and to do a lot of cooking. I still have days when I beat myself up for not learning more about domestic life and the domestic arts when I was younger - knitting, sewing, painting, et cetera. My grandmother, my mother, and my aunts are all amazing at these kinds of things. I'm learning, but boy oh boy do I long for a different skill set than the one I spent so many years cultivating. Thanks for your honesty. It helped me to get a little perspective today. Oh my goodness. This is my life. There are only six of us, and no snow, but otherwise, exactly my life. Without cooking to save my sanity, I'd have run away from home long ago. "I also realized that cooking is inexpensive therapy. It's something I can control, a problem easily solved. It engages my senses and my brain. It nourishes my family." THIS! This is exactly how I feel around cooking. My family is only 2 at the moment, but cooking is my sanity. It is my problem solved amongst life as a full time student, full time youth director, with a spouse who commutes 2 hours every day! I'm so with you on the playing thing. I have 3 daughters and they are each bossy! And by bossy, of course I mean unrefined leadership skills. But, still! When I try playing pretend with them or build duplo blocks with them, I'm always doing it wrong. Sheesh! But, I rock it in the kitchen with them, we read like all-stars, and craft up a storm. You're right...it's all good! Ugh, I'm so jealous. This is how I WISH I felt about cooking. But I just don't. I just really, really don't. I am with you on the playing with kids thing though. Will read to them for hours happily; will do anything, anything at all to avoid playing trains at all cost. Can I get an AMEN on hating Candyland too? I once had a sitter come who said she just adores Candyland and I am still not over that. I didn't know anyone liked Candyland, except for 4 year olds. The worst. But reading together? Yes. Cooking together? Sure. Wrestling with their dad when he gets home? Yup. If my kid ever says what Calvin said, I will die of happiness times 1000. Last week I was anticipating a full day Saturday meeting with a non-profit board on which I serve. Emails flew about our itinerary and breakfast. I offered to make cookies for lunch dessert. The response came that I didn't need to since I'm "so busy". 3.5 seconds later I replied asking to do it. Creating in the kitchen is cheaper than therapy. I love it. But I am single and don't have a family to cook for so I look for opportunities to cook for others. I love how you serve your family that way. I am a 60 year old grandma and I loved this post because it totally resonated with me. We could be twins! :) I never liked to "play" with my kids and still don't like to play with my grandkids...I know that's a terrible thing to say...but there I said it. But, I let my kids make messes, they made forts in and out, they did art and crafts, we had a lot of fun.... And when I'm stressed I still head to the kitchen where I bake and cook to my hearts desire. Your kids will know how to entertain themselves, will know they "aren't the center of the universe" and will be creative! :) You will end up sane as a mom (although of course some days you will wonder), and your kids will be happy, loved and well-adjusted. You keep up the good work! Sounds like you are doing an incredible job and your kids are blessed to have you for their mom! So mind numbing! You are not alone. There are so many "requirents" on moms these days. We can't all be robots. Being your unique self is the way to be! I also start to love to do cooking, but i have to admit that I am very lazy.. But every time I see that people love to eat what I cook, I am so happy! That poem is one of my favorites and sweetly sums up good mothering, even if it was in the kitchen with nursy while the parents were off at a dinner party. I totally relate to not enjoying playing. I can set up the dollhouse or organize the toy boxes but when it comes time to actually pretend I am a part of the game, imagination fails me. But I love my kids and so I find my mothering groove in reading to them or painting with them or organizing their stuff. We all have a different groove and the important thing is letting them know we care. Mmmm we love "McMuffins"! Sounds like a soul feeding day. I tell my kids that exact same thing: "Only Boring People get bored." But I thought I made it up. Here's what I like to play: I'm the baby and they're the mommy. Or, I'm a Russian spy that has taken over their mommy's body. Or, that I'm just a simple Irish made and I don't know anything about what the password on the computer is. Basically, the only kind of playing that I do involves unintelligible (or nearly so) speech. Snow days have definitely threatened my joy of wife and motherhood. Not outright killed it, but definitely threatened. But only (in the words of my 12.5 year old smartypants) when my kids don't do what I say or when I'm mad at someone not my kids. Did he get so smart at school? Because he needs to go back for a 5-day stretch of full days. Ok, so I'm the odd duck. I love playing with my girls (ages two and three) Love it. The blocks, the trains, the pretend food, the imaginary stories. My fave. Cooking and all the other stuff makes me want to pull my hair out, lol. I'm 36 and never remember my parents playing with me, nor any of my friends' parents playing with us. Is this a generational thing? Did that mean our parents didn't love us? Heck, no! If playing with your kids is one of the ways you enjoy connecting with them, then good for you. I'll enjoy connecting with my kids in other ways and shouldn't (won't!) feel guilty about it. Hi Robert. I have six year old twins. They have each other to play with. They don't need me. I take them on adventures and I facilitate play (crafts) for them. I don't feel guilty and all for not playing. They have a grand life! Yes, yes, yes! Cooking and baking and crafting is how I bring sanity to my days. Add some hot tea and a good book, and I'm good to go. My daughter called them Eggs McMommy because I made them. I never have enjoyed playing pretend with my kids - I decided to roll with it - my mom never did with us either. But I do cook good food too, and although I also don't really like reading to them, we own a million books, give or take a couple, and their parents are reading all the time. And because my kids have always had to play without me, they have developed good playing alone and with sibling skills. Not that I think parents can't play with kids, but rather this has been me realizing that every parent really is different - maybe I am not playing or reading (that much - I still do it) with my kids - but I do have good food, and we only watch one movie a week usually, and that's it for TV,so everything is a give and take, a balance. Also, we call them egg mcmuffins too, and I don't even like McDonalds. But I don't know what else to call them either. Oh girl... Amen to Barbie and Polly Pockets... I die. My daughter, who is all grown up now, still remembers that I 'owe' her an afternoon of playing Barbies or Winnie the Pooh with all her character stuffed animals! oy! And I only had one... sooooo, that made it harder and my annoyan-- um, displeasure in these activities way more visible! (And how in the world was I not already stalking you on Pinterest?) Problem solved!